But now is the time to look forward, to hope that 2013 will turn out better than the past years. And that I can keep moving forward and not revert to my former self. I kind of like myself right now, I’ve never done that before. I’ve always hated myself for some reasons, but I seem to have overcome those thoughts. Or at least they aren’t as apparent as they’ve used to be, which is great and feels great. And I’m having a great time with Miiverse, Nintendo own forum like service for the Wii U. I just love watching peoples artwork. Some people are so amazing, they can do really great stuff while having to use such a small area to draw on. And yesterday or rather earlier this morning I found these two hotties of Princess Peach. Yeah, they are over sexualizing here but I just they they are great artworks and they are hot. 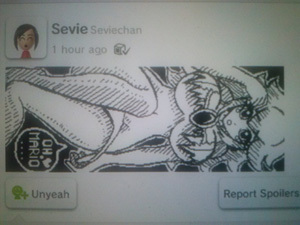 If you have a Wii U and like what you see, follow the artist you can see her name in my photos. Goodbye Näsby! For good now! 4 responses on Goodbye 2012! Hello 2013! And I miss having fun with games. All I’ve been gaming the past weeks is Triple Town on my HTC. ;P Nothing bad with smartphone games, but I really, really miss the “good old days” when I could stay up late and game the night away. You might be getting a bigger home, but then again you might feel so much better in the new home. You can relax on a whole different level, that you probably(?) haven’t been able to do for the past months I assume? Then the gaming will come naturally again and it will feel good. I went through that before I moved to my smaller apartment. Thanks a lot for the supporting words! :) Makes me feel a bit better. Sometimes I’ve been worried that my gaming days are over or at least will never be the same again. But all my gaming gear has been packed away since June. And in all this mess, there is not a lot of feeling relaxed. There’s always something that has to be taken care of it seems. I think without a doubt you’ll get into gaming again once you have moved. As soon as the stress dies down and you can relax I’m positive you’ll find the enjoyment in gaming again. Just being able to pack up all your stuff again will probably make you feel that much better.